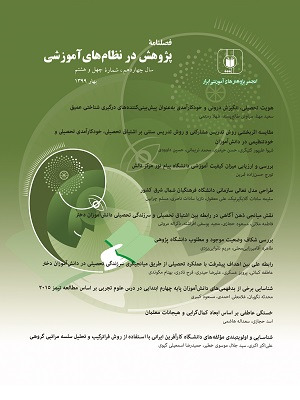 تهیه سؤالات دشوار با الگوریتم‌های محاسباتی پیچیده، منجر به روندهای نابجا مثل راهبردهای آموزش تست­زنی و آمادگی برای آزمون در بین آزمون­شوندگان شده است. داشتن استانداردهای آموزشی دقیق و کاربرد الگوهای رده­بندی کمک می‌‌کند تا ارزشیابی بهتری از برنامه­­های آموزشی، محتوای درسی و همین‌طور پیشرفت تحصیلی دانش‌آموزان به دست آید. در این نوشته به بررسی نمونه­ای کوچک از مجموعه سؤالات چهارگزینه­ای حساب دیفرانسیل در چهارچوب هدف­های رفتاری پرداخته شد که مبتنی بر ترکیب رویکرد بلوم و وب بود؛ هدف معرفی رویکرد توان-پیچیدگی در رده‌بندی سؤالات آزمون‌ها بوده است. 12 سؤال از یک آزمون 30 سؤالی که روی یک نمونه 3409 نفری از دانش‌آموزان اجرا شد که بر اساس رویکرد توان-پیچیدگی رده‌بندی گردید. نتیجه مربوط به 3 سؤال آن در این مقاله آمده است. نتایج نشان داد که سؤالات این آزمون همگی دانش روندی را اندازه می­­گیرند و عمدتاً در سطح 3 پیچیدگی قرار داشته­اند. همچنین 92% سؤالات انتزاعی بوده و برای پاسخ­گویی صحیح به هر سؤال هم‌زمان باید چندین الگوریتم محاسباتی مختلف فراخوانی شوند. سؤالاتی که تنها از یک الگوریتم برای حل آن‌ها استفاده شده و سطوح پیچیدگی کمتری داشته­اند از پارامترهای آماری بهتری مثل مقیاس‌پذیری برخوردار بوده‌اند و تابع آگاهی آن‌ها اطلاعات بیشتری از توانایی آزمون­شوندگان فراهم می‌کردند. سیف، علی‌اکبر. (1385). روش‌های اندازه‌گیری و ارزشیابی آموزشی. تهران: دوران. Airasian, P. W., & Miranda, H. (2002). The role of assessment in the revised taxonomy. Theory into practice, 41(4), 249-254. Bloom, B. S., Hastings, J. T. & Madaus, G. F. (1971). Handbook on the Formative and Summative Evaluation of Student Learning. New York: McGraw-Hill. Bloom, B. S. (1956). Taxonomy of educational objectives, handbook 1: Cognitive domain. New York: McKay. Confrey, J. (1990). A review of the research on student conceptions in mathematics, science, and programming. In C. B. Cazden (Ed. ), Review of research in education: Vol. 16 (pp. 3–56).Washington, DC: American Educational Research Association. Florida Department of Education. (FCAT). (2008). Cognitive Complexity Classification of Fcat Test Items. Florida Comprehensive Assessment Test (FCAT). Gagné, E. D, Yekovich, C. W., & Yekovich, F. R. (1993). The cognitive psychology of school learning. New York: Harper Collins. Hess, K. (2005). Introduction to Depth of Knowledge (DOK) - Based on Norman Webb’s Model. Kentucky Department of Education. Center for Assessment/ NCIEA, 2005. Hess, K., Jones, B. S., Carlock, D., & Walkup, J. R. (2009). Cognitive rigor: Blending the strengths of Bloom’s Taxonomy and Webb’s Depth of Knowledge to enhance classroom-level processes. ERIC: ED517804 NYC Department of Education. Introduction to Depth of Knowledge [Video]. Krathwohl, D. R. (2002). a Revision of Bloom's Taxonomy: An Overview. Theory into Practice 41 no4 2002. http://coe.ohio-state.edu/. Rothman, R. (2002). Statewide Testing Programs, In: Encyclopedia of education (Vol. 8) edited by James W Guthrie, New York: Macmillan Reference USA. Sforza, D. (2014). The Inclusion of Cognitive Complexity: A Content Analysis of New Jersey's Current and Past Intended Curriculum. Seton Hall University Dissertations and Theses (ETDs). Paper 2020. Thompson, T. (2011). An Analysis of Higher-Order Thinking on Algebra I End-of Course Tests. International Journal for Mathematics Teaching & Learning. Webb, N. L. (2005). Web Alignment Tool. 24 July 2005. Wisconsin Center of Educational Research. University of Wisconsin-Madison. <http://www.wcer.wisc.edu/WAT/index.aspx>. Webb, N. L. (2002). Depth-of-knowledge levels for four content areas. Language Arts. March 28. Webb, N. M., Herman, J. L., & Webb, N. L. (2007). Alignment of mathematics state‐level standards and assessments: The role of reviewer agreement. Educational Measurement: Issues and Practice, 26(2), 17-29. Zimowski, M., Muraki, E., Mislevy, R. J., & Bock, R. D. (2003). BILOG-MG 3: Item analysis and test scoring with binary logistic models. Chicago, IL: Scientific Software.